When it comes to food, being organised is KING. Do you know that feeling when you open the freezer door and it’s filled with goodies ready to be eaten? I have to admit, it doesn’t happen often enough in this house. But when it does, it feels GOOD. These coconut flour muffins are perfect for making ahead and freezing. Want a quick breakfast? Feel like a low carb snack? Whip out a couple of Keto blueberry muffins and enjoy! 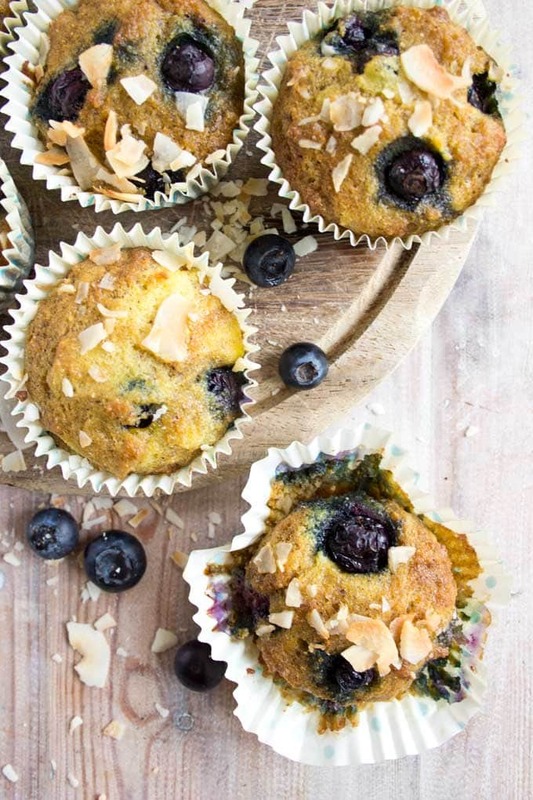 The recipe for these blueberry coconut flour muffins is so easy and quick – you only need 8 ingredients, which you can simply stir together in a bowl with a spoon. I haven’t waxed lyrical about the benefits of coconut flour for a while, so here we go: Coconut flour has high levels of healthy saturated fats, which balance blood sugar levels and aid the metabolism. It is nutrient-dense, high in fibre and low in sugar. And even though you might find it expensive, a little goes a long way – it is way more absorbent than almond flour, for example, and rather filling. Above all, I love the gentle coconutty taste! It works supremely well with the fruity blueberry bursts. If you are a fan of coconut flour recipes, you should also check out these low carb zucchini muffins and my sugar free coconut blondies. You might notice that I have used both erythritol and liquid stevia in this recipe. I find that this way neither the cooling taste of erythritol nor the sometimes perceived as metallic taste of stevia shines through – and the result is as close to table sugar as you can get. This mixture makes 8 muffins. They freeze well and you can keep them in an airtight container in the fridge for several days. 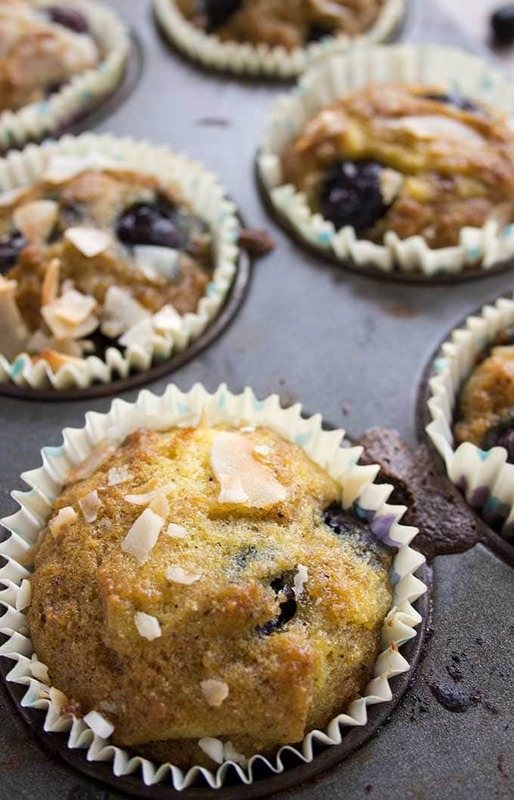 I cannot begin to tell you how good it felt when we decided to ignore the alarm clock the other morning and had around 10 minutes to get dressed and get out of the house ….. with low carb coconut flour muffins in our hands. 4 were eaten on Monday. 4 on Tuesday. Do you know what my good intention was on Wednesday morning? Next time I’ll make a double batch. Preheat your oven to 180 Celsius/356 Fahrenheit. Sift coconut flour into a bowl. Add all ingredients except for the blueberries and blend well. Stir in the blueberries, keeping a few back for decorating. 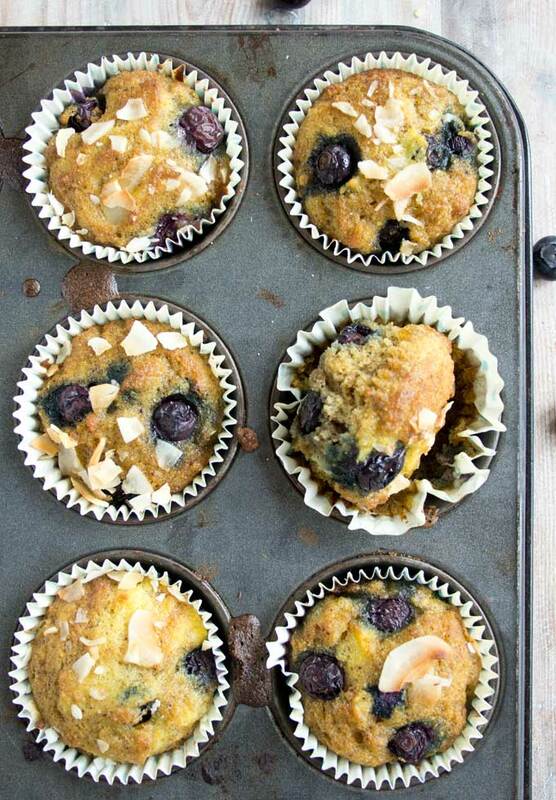 Place the remaining blueberries on top of the muffins. Bake at 180 Celsius for ca 25 minutes or until golden brown on top. For an even lighter dough, you can separate the eggs and whisk the egg whites until stiff peaks form. Fold in the egg whites after you have mixed the dough. Then add the blueberries last. If you tend to detect an "eggy" taste in low carb baked goods, you can leave out 2-3 egg yolks. You can use frozen blueberries, however, fresh ones will hold together better and get less soggy. 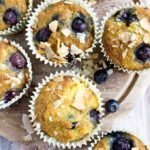 I updated the post blueberry coconut flour muffins in January 2019 with a recipe change to reflect how we make this recipe now. These turned out very well! I have never used cocnut flour before. I had been craving something sweet and pastry like! These will save me. One thing i need to ask. Does coconut flour not have a strong flavor? They turned out great but the flavor was a little lighter than i had expected. Other than that, they are blissful! Thank you! I think coconut flour has a gently sweet flavour, a little coconutty, but not over-powering. But you know how it is with flavours, some people hate it, some love it. I find that there are differences in coconut oils more than with coconut flours. Fabulous!! These are the best tasting and lightest keto muffins I have made. I did whip the whites and used 4 yokes, not 6. I always mix my sweeteners, 1/2 stevia, 1/2 erythritol. Best recipe ever! Thank you so much! I made these today and had to blend them by hand because my mixer is broken, I believe they weren’t as good because of that (didn’t take points off ). I did reduce the yolks by 2 but the muffins still tasted eggy to me. As soon as I get my blender I’ll make them again and this time I’ll only add 3 yolks. Very good. I thought they would be eggy, but they were just right. Only thing I would ask, is if there’s any way I can make these a little more most? They were a little dry. Other than that they were very good . Can you freeze these muffins? I made a big batch recently and realized I will not be able to eat them all in time. I would hate for them to go to waste. I was wondering if you’ve tried to freeze them and how well they held up after thawing out. Yes, you can freeze them no problem. I’ve stuck them them straight in the microwave to defrost and that works fine. Is there a big difference if you only use stevia ): wasn’t that big of a fan ? But I guess I have to get use to keto taste ! It’s a personal preference. I think stevia has a metallic taste which I am not a big fan of. That’s why I only use it in small amounts. But I know people who don’t mind the taste at all! I’m going to make these once the pumpkin brownies have been eaten. Yum! If I leave 2 egg yolks out do I add 2 extra whites please? Hi Janet, I wouldn’t add any more egg whites. If you feel your dough is too firm consider adding 2 tbsp of coconut cream instead. Dairy free so I was happy to find this recipe but their parents don’t want them to have Stevia or erthritol. They’re not that happy about regular sugar, prefer honey or maple syrup. But I will use regular sugar for my first double batch. Thanks! Hi Deborah, of course you can use regular sugar in this recipe. Or you could use coconut sugar, which has a nice taste – a bit like brown sugar – it has a lower glycemic load than table sugar. These are fantastic delicious filling and easy to make, it doesn’t get much better than that! Hi Ewa, I’m so glad you like the recipe. Eggy taste can be an issue with coconut flour recipes, because they generally require more eggs than, say, almond flour recipes. If you really don’t want to taste eggs in recipes, you can also leave out a couple of egg yolks, because that’s where the egg taste comes from. My husband counts his macros. Why are there two completely different nutritional labels? We love these muffins and I just made my second batch! Hey Laurie, thanks for pointing this out. I recently switched recipe plugins and the mistake must have happened then. To be 100% certain I have just re-calculated the nutrition. Sorry for the confusion. I’m very happy, however, that you’ve made a second batch of the muffins!!!! Isn’t stevia bad for u? It’s an artificial sweetener right? Can you make this in a loaf OAN? How long baked? Made these tonight. Very good! Brilliant! I’m glad they turned out well. Happy you like them!! Yes, yes, yes. Gimme one right now!!!!!! And I can totally relate to what you say about good intentions, haha! This one is a keeper. I’m a type 2 and have been managing my condition with a low carb diet. Once you get into baking grain and sugar free, you never look back.I recently made you chocolate tart when I had friends over, and they could not tell at all it was sugar free! I totally agree with you. I’ve been serving up sugar free desserts to friends for years, and they never guess… Who needs sugar, right? Thank you for this recipe! Made them last night, as soon as I saw your post. They are so good! 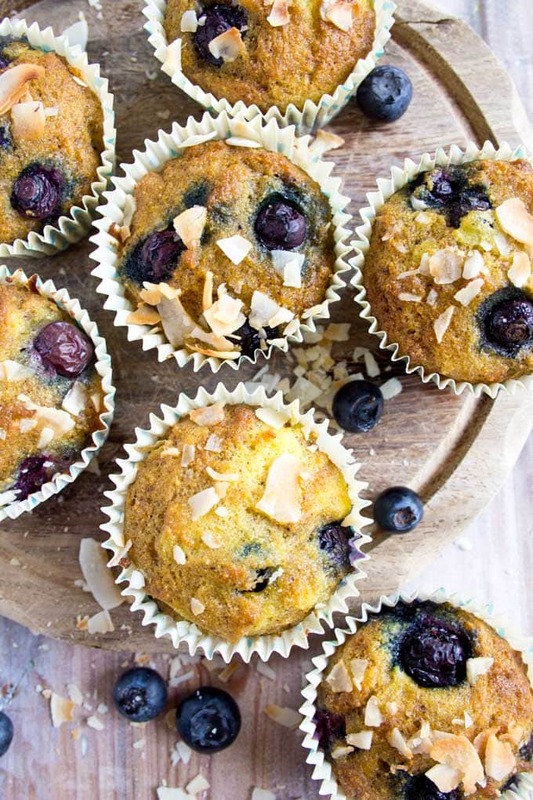 I’ve been looking for a blueberry muffin recipe. Will try these asap!